Haywards Heath Town boss Shaun Saunders told his players after the famous Crawley Town victory: "Don’t put this performance in tonight and then let us down on Saturday." Heath pulled off a stunning Sussex Senior Cup shock as they beat League Two Crawley Town on Tuesaday night - a team who had reached the final of the prestigious competition for the last two seasons. A bizarre own goal from Germain Dua, a penalty from Callum Saunders and a calm finish from Max Miller gave Heath the win. But speaking after the game, Saunders said: "I just said to them, don’t put this performance in tonight and then let us down on Saturday. We need to carry this on. 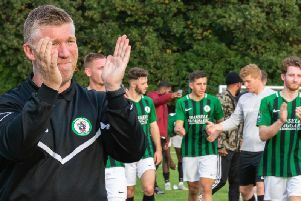 "Hopefully we can carry this performance on and I have to make sure they are in the right mindset on Saturday and try and get some kind of result at Whyteleafe. "They are a tough side and they are up there and they are challenging. It will be a tough one but on our day we can beat anyone. "We were unlucky not to get something out of the game on Saturday against a side that are rolling the league (Cray Wanderers)."